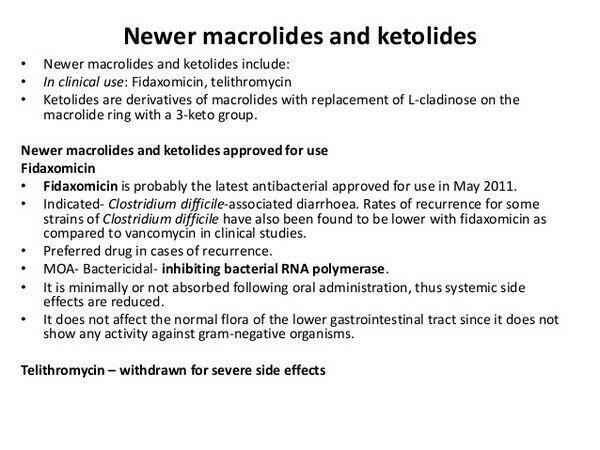 Ketolides are a new class of macrolide derivatives designed specifically to combat macrolide-resistant respiratory tract pathogens. The ketolides exhibit good activity against gram-positive and some gram-negative organisms and have excellent activity against drug-resistant S. pneumoniae, including macrolide-resistant strains. Spontaneous resistance to the available ketolide, telithromycin, is rare. Ketolides display excellent pharmacokinetics that allow once-daily dose administration and extensive tissue distribution relative to serum. The ketolide telithromycin is well tolerated; its side effects are primarily gastrointestinal symptoms (diarrhea, nausea, and headache). Like the macrolides, ketolides act by binding to the 23S ribosomal RNA (rRNA) in the 50S subunit of the ribosome. Binding to the 23S rRNA inhibits the translocation of RNA during protein synthesis and blocks bacterial protein synthesis. Ketolides and macrolides have essentially the same binding sites, located on a portion of the rRNA and on ribosomal proteins, but ketolides bind to ribosomes with higher affinity than macrolides. This attribute could contribute to ketolide activity against macrolide-resistant strains. Telithromycin (Sanofi-Aventis/Fujisawa/Sankyo's Ketek), an oral ketolide, is the first member of this new class to be approved for clinical use. Ketolides are structural variants of macrolides, and their modification results in target binding without tripping the inducible resistance to macrolide drugs that many groups of pathogens exhibit. Telithromycin was first approved in Europe in 2001; Japanese approval was attained in 2003. In the United States, telithromycin's approval was delayed for more than two years. The FDA issued Aventis an approvable letter for telithromycin in 2001 and requested additional data to support the filing. Aventis conducted the largest-ever comparative antibiotic trial, enrolling more than 24,000 participants to support U.S. approval, which was granted in April 2004. The product was launched in August 2004. The agent is expected to retain patent protection through 2015 in the United States and Japan and 2016 in Europe. Telithromycin is active against a broad range of pathogens, including S. pneumoniae (including multidrug-resistant strains), H. influenzae, M. catarrhalis, C. pneumoniae, S. aureus (methicillin- and erythromycin-susceptible isolates only), and M. pneumoniae. Against isolates of S. pneumoniae, telithromycin has been shown to demonstrate concentration-dependent bactericidal activity in vitro. 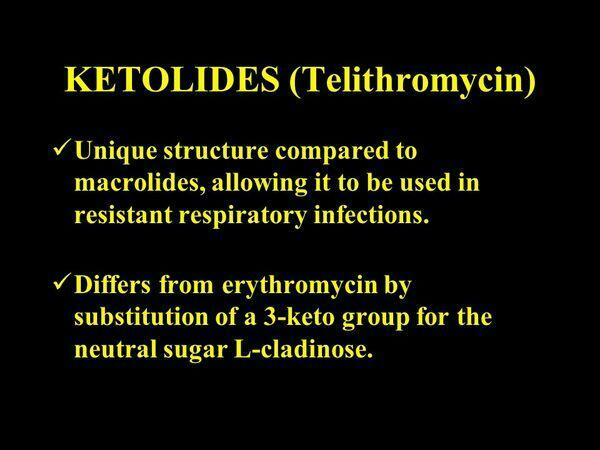 Telithromycin's advantage over currently available macrolides lies in its enhanced activity against erythromycin-resistant S. pneumoniae.Antibacterial activity against other respiratory pathogens, such as H. influenzae and atypical bacteria, is similar to that of available advanced-generation macrolides — except that telithromycin's activity is slowly bactericidal rather than bacteriostatic against most respiratory pathogens. The agent appears to have a lower propensity to induce certain types of resistance (inducible methylase gene expression). Telithromycin has demonstrated equivalent activity to clarithromycin, trovafloxacin, and amoxicillin, with clinical success rates ranging from 88.3% to 94.6%. The agent's safety and efficacy for the treatment of community-acquired pneumonia have been shown in four randomized, double-blind, controlled Phase III studies. In the first trial, telithromycin (800 mg once daily) was compared with clarithromycin (500 mg twice daily) for ten days; clinical efficacy of telithromycin and clarithromycin was 88.3% vs. 88.5%, respectively. In the second trial, telithromycin was compared with trovafloxacin (200 mg once daily for seven or ten days); efficacy was reported at 90% for telithromycin and 94.2% for trovafloxacin. This study was stopped prematurely after trovafloxacin was restricted to use in hospitalized patients with severe infection. The third study compared telithromycin with amoxicillin (1,000 mg three times daily for ten days); efficacy was reported at 94.6% for telithromycin and 90.1% for amoxicillin. Finally, a fourth trial compared telithromycin (800 mg once daily for seven days) with clarithromycin (500 mg twice daily for ten days); efficacy was reported at 88.8% for telithromycin and 91.8% for clarithromycin. Telithromycin's side effects include nausea and diarrhea, which occurred in Phase III studies at rates comparable to the rates of comparator antibiotics. The product is also associated with visual disturbances — namely, blurred vision and/or difficulty focusing — in approximately 1.1% of patients. In a health outcomes analysis of two Phase III studies that compared telithromycin with clarithromycin in community-acquired pneumonia patients, telithromycin was associated with a mean per-patient costs savings of $185 to $419. © 2018 - AntiinfectiveMeds.com. Designed on rtPanel WordPress Theme Framework. Disclaimer: We are not a pharmacy and do not sell any medication ourselves.